Eine Veranstaltung der AG Netzwerkforschung in der Deutschen Gesellschaft für Soziologie im Rahmen des SFB 536. 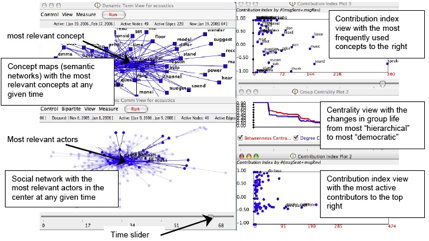 Condor visualizes and analyzes communication activity, content and unstructured text, showing the evolution over time, while respecting individual privacy (Gloor & Zhao 2006). Condor has been developed for the last six years at MIT, Dartmouth College, University of Cologne, and others. It takes as input any type of communication archives such as e-mail, phone records, blogs, Weblinks, or f2f interaction records. An interactive movie shows the evolution of social networks over time, displays active relationships in a sliding time window, and calculates and plots the evolution of network metrics over time to discover interesting events in the lifetime of a virtual team and different phases in the life cycle of virtual communities. In addition to the social network view, the same algorithms are also applied to textual content analysis. Free text documents are parsed, and a keyword document frequency index is calculated. The main advantage of Condor compared to other tools such as Ucinet, Pajek, Inflow, etc. is its capability to generate temporal social network movies combined with textual analysis. Gloor, P. Zhao, Y. Analyzing Actors and Their Discussion Topics by Semantic Social Network Analysis, Proceedings of 10th IEEE International Conference on Information Visualisation IV06, London, 5-7 July 2006. The right side of figure 1 illustrates Condor’s temporal elements. The contribution index view positions people based on the number of messages they exchanged, and terms based on the number of new documents in which they appear. The centrality view plots a continuous curve of the changes in group betweenness and degree centrality as well as graph density of both social network view and concept view.